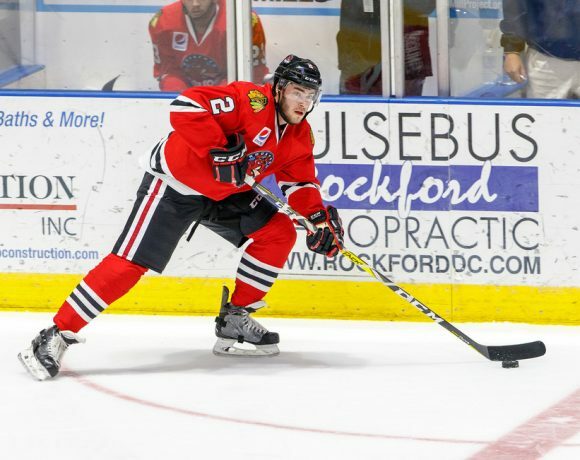 The Rockford IceHogs got the 2014-15 season underway this past Saturday at the BMO Harris Bank Center. The Milwaukee Admirals cast a pall on the festivities for the 5,228 fans in attendance, besting Rockford by a score of 3-2. With just one contest in the books, I’m putting this opening game under a bit of a microscope. 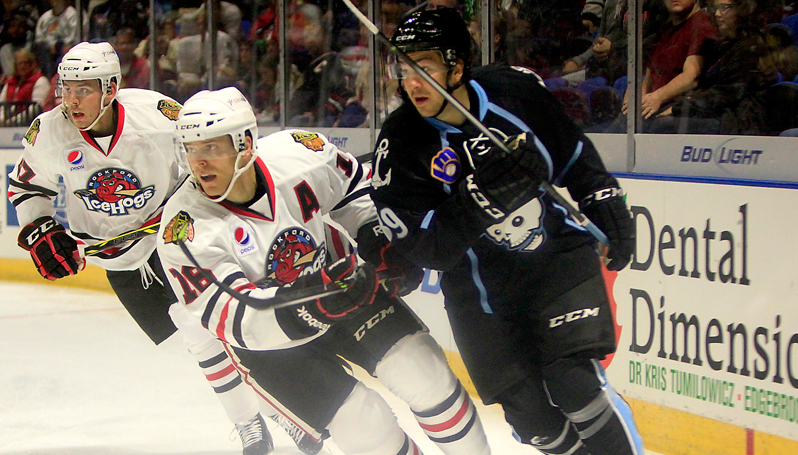 Here’s how the puck bounced for the IceHogs as they threw open the doors on the new campaign. Rockford got on the board late in the opening period. Ryan Hartman finished a play that started with Phillip Danault gaining possession of a loose puck in the neutral zone. Danault hit Matt Carey at the left circle. The resulting shot skidded under goalie Marek Mazanec pads before coming to a stop a few inches from the goal line. Hartman got to the puck and got enough stick on it to send it across the line. Rockford’s 1-0 lead barely lasted through the intermission. The Ads tied the game 21 seconds into the middle frame and took the lead in the sixth minute. Hartman picked up his second goal of the contest at the 16:12 mark when he took a pass from Zach Miskovic at the Milwaukee blue line. Skating toward the top of the right circle, he sent a wrist shot toward Mazanec that deflected off of an Admiral skater and into the net. Milwaukee broke the tie in the eight minute of the third period when Fredrick Gaudreau won a puck from Adam Clendening behind the Hogs net. Gaudreau hit Joe Pendenza, who slung in the game-winner before Michael Leighton could get across the crease. Clendening failing to pick up the puck behind his net was the impetus for the Admirals third goal. To be fair, however, it was his hustle on a breakaway by Milwaukee’s Brendan Leipsic late in the first that prevented a shot attempt and started the chain of events that led to Rockford’s first tally. Nordstrom came to the defense of T.J. Brennan after he was laid out by Triston Grant during a Rockford power play early in the second period. Grant was called for kneeing Brennan and it looked like the Hogs were about to get 75 seconds of 5-on-3 time. Before Grant could be escorted to the penalty box, Nordstrom skated over and engaged the veteran winger in fisticuffs. Nordstrom’s heart may have been in the right place, but his head was in the line of fire against a guy with 133 AHL fights. Though the scrap wasn’t much to speak of, Grant definitely got the best of the young Swede. Nordstrom took fighting and instigation penalties as well as a ten-minute misconduct that kept him out of action for the remainder of the period. More importantly, a chance to break what was a tie game at that point was squandered. Cody Bass and Pierre-Cedric Labrie (and now Brandon Mashinter) are in town for a reason and likely could have sent a more eloquent message to Grant, preferably after the Hogs had taken the lead with a power play goal. I guess the silver lining is that Nordstrom had the stones to stick up for a teammate (and a pretty new one at that). However, he could have done more damage on the scoreboard. Hartman was named the game’s second star (Mazanec was first star) and the West Dundee native had himself a two-goal performance in his first game as a professional. I know that I have said this before, but I am really looking forward to seeing him play at this level. In his brief stint with the team last spring, Hartman seemed to have a knack for being in the middle of the action. He was in the right place at just the right time to get Rockford’s first goal of this season. Rockford’s first power play unit featured both Clendening and Brennan, along with Teravainen, Nordstrom and Garret Ross. That combo could prove to be a handful to stop when shorthanded as that unit features the AHL top two scoring defensemen up top. On the other hand, Clendening was just fine quarterbacking the first power play unit last season. Putting two skilled players side by side could result in a too-many-cooks type of situation. The IceHogs were 0 for 5 on the power play. On the other hand, the penalty kill that was abysmal a year ago also held Milwaukee without a tally in five attempts. Clendening and Brennan both served on the penalty kill-though not together, thank goodness. Traditionally, the IceHogs take their sweet time naming a captain each season. It wasn’t until the middle of January that coach Ted Dent tabbed Jared Nightengale with the captaincy. Most years a captain is named in the first two months of action. Saturday night two players, Klas Dahlbeck (who wore an A last season) and Cody Bass, were designated assistant captains. Miskovic and F Mark McNeill are two Hogs who I could have also seen earning a letter on their sweater, but past seasons have indicated that this is going to be a work in progress. F Brandon Mashinter is joining the IceHogs after clearing waivers over the weekend. Mashinter was injured late in the Blackhawks training camp. This is a plus from the perspective of the Rockford franchise. Mashinter has been a productive player with physical presence throughout his AHL career. There is no roster limit in the AHL, so management isn’t duty bound to move any of Rockford’s 24 players. However, Ryan Schnell is the lone forward solely on an AHL contract and it wouldn’t be shocking if he was loaned to Indianapolis. Having kicked off the season at the BMO Center for the first time in three years, the IceHogs will be traveling East for the next two weeks. Rockford gets the road trip underway Thursday in Adirondack and is in Ontario over the weekend. The Hamilton Bulldogs are the Saturday opponent and the Toronto Marlies await Sunday afternoon. Last year Rockford used an additional assistant captain on the road, so we’ll see if that is the case this week. The IceHogs stop in Rochester next Wednesday before coming home October 25 to tangle with the always physical Chicago Wolves.